The Lower Cretaceous is the first geological epoch in the Cretaceous. It began 145 million years ago, and ended 100.5 million years ago. Lasting for about 46 million years, this is the longest stage in the Phanerozoic eon. It is longer than some of the geological periods in the Phanerozoic. The Lower Cretaceous is best displayed in England, where it is composed of two series of rocks. Between the two is a major rise in sea level. Lower, the Wealden Beds, laid down in freshwater or brackish conditions. Sands came from the flood plain of a huge tropical braided river. Clays came from a coastal lagoonal plain. Upper, the Greensands, an olive-green sandstone deposited in the sea; and the Gault Clay, a formation of stiff blue clay deposited in a calm, fairly deep water marine environment. It overlays the Lower Greensand formation. 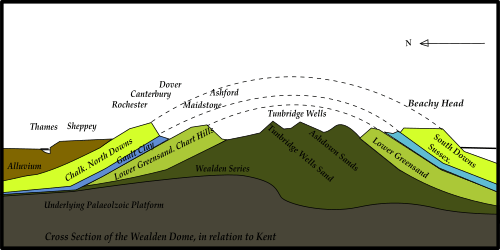 A simplified geological diagram of the Wealden Dome as relating to Kent. The two parts of the Cretaceous represent the sea level where the divisions were first defined. In the Lower Cretaceous, the sea level was much lower than in the Upper Cretaceous. In the Wealden, Southern England was a huge tropical river delta; in the Greensand the same areas were just offshore. However, in the Upper Cretaceous the deposits were made in deeper water, on what was then the continental shelf. Sea level then stood at its highest level in the Mesozoic. Lower Cretaceous Facts for Kids. Kiddle Encyclopedia.